South Australia - Colonial period: 1855-1900. Ordinary rate delivery envelopes: SC-EO-5. 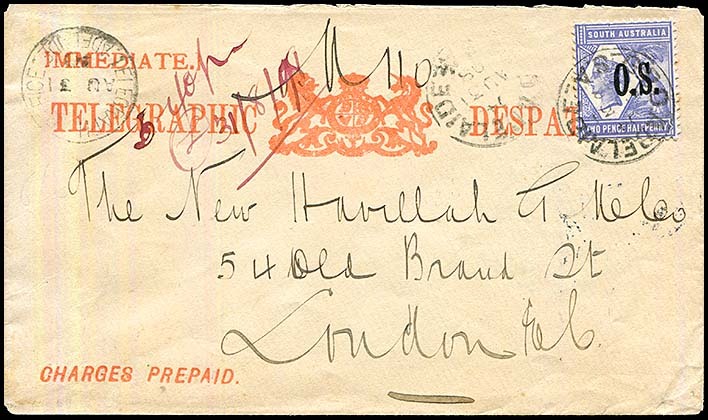 Heading and notes: TELEGRAPHIC DESPATCH spanning Crest. Reverse side: Blank - no flap seal. Size of envelope overall: 80 × 138 mm (with some variation). has entries in the lower left corner to indicate monies to be collected. has entries indicating amounts to be collected (if any) in the lower left corner. 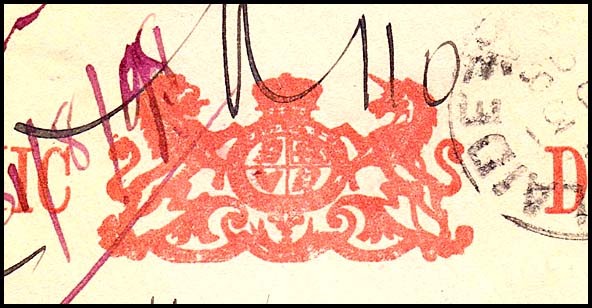 SC-EO-5 - details of the Crest. the tails are thinner and the decorations under the rear feet are considerably simplified. Previous SA Colonial envelope (SC-EO-4). Next SA Colonial envelope (SC-EO-6). Overview of South Australian Telegraph stationery.